Moving Entities Across Business Modules – Welcome! How can we help? This feature allows the user to move entities from one business module to another. This is useful in various cases. An example could be if a solution has a Projects business module which contains all active projects, and another Projects module used to store all archived projects. 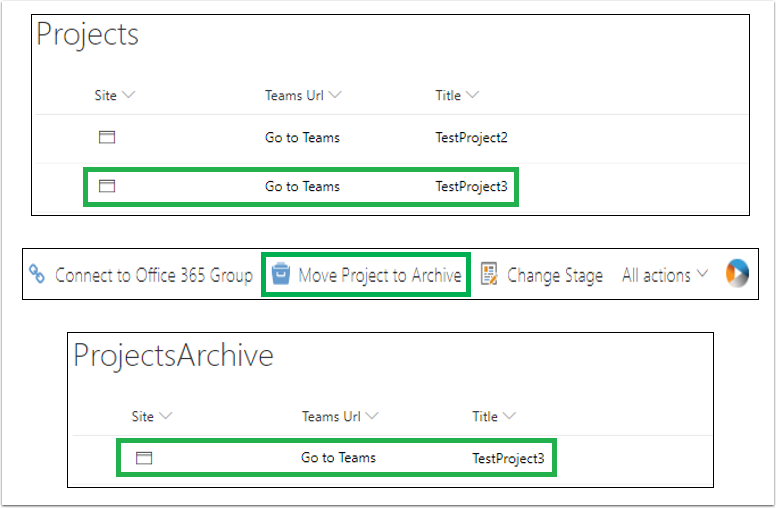 This feature makes it possible to move a finished project from the active Projects module to the Archived Projects module for storage. This makes the solution more scalable and help respect limitations on entity counts. WorkPoint Business Modules performs best if the entity count is below 5000 because of Microsoft SharePoint software boundaries and limitations. This is especially true if unique permissions are assigned to many entities. So, in case a solution approaches this count, but many of the entities are completed, it is now possible to move these to a separate storage module using this feature. Another example could be moving items from a pipeline module to a project module. When a lead in a pipeline module becomes a project, it can now be moved to a project module. So instead of combining many modules/stages into one module it is now possible to divide the module into multiple modules and move the entity through the modules during the entity life-cycle. Another great aspect about this feature is that it is possible to set up security settings tailored for both the active projects and the archived projects, should these differ for the solutions users. This feature can be used through the WorkPoint 365 WebAPI. For more information about the WorkPoint 365 WebAPI, visit this website: https://support.workpoint.dk/hc/en-us/articles/206969638-WorkPoint-365-Web-API. The Move Action is described technically in detail in this link: https://wp365webapi.azurewebsites.net/Help/Api/POST-api-Entity-Move. It is important to note that the site for the entity does not get copied. The site for the entity is still the same after moving the entity. For use through Action Management an Action Management license is required. 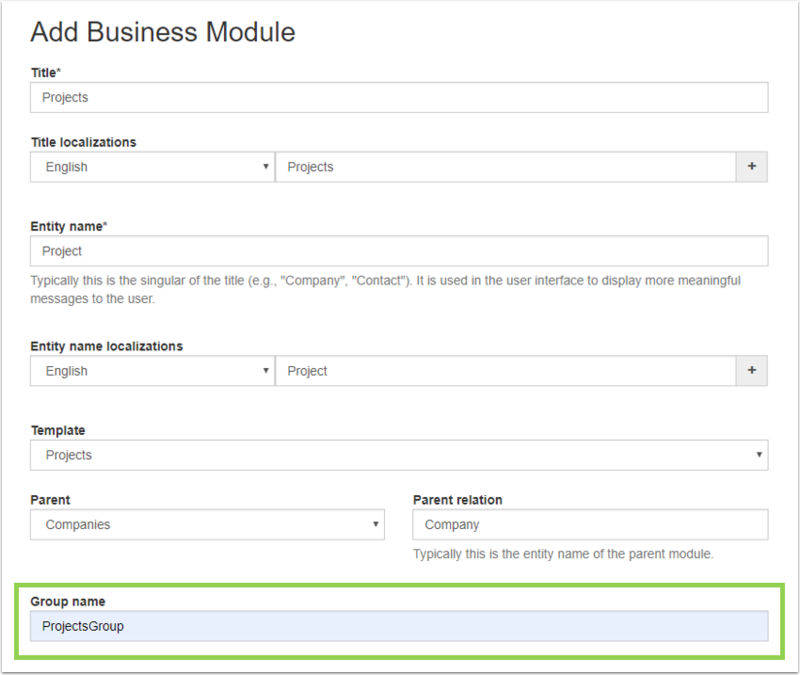 The two business modules to move an entity from and to need to have the same module group name. If no match is found between any business modules, none will be selectable through the creation interface of Action Management. It is important to note that if using this feature through the WorkPoint 365 WebAPI and no Module Group Name is defined, an error will be returned in the result information for the WorkPoint365.WebAPI.Model.MoveEntityResult call. In order to use this feature through Action Management, an action and a trigger need to be set up through the Action Management interface. Navigate to the Action Management interface for the business module for which the action is needed. Click the “Add Move Entity Action” button. A title for the action can be set. If the action should be active, check the Active checker. Select the target business module. This is the module to which you wish to move an entity to. Select the stage you want the moved entity to be stored as. If there is a stage on the target module that matches the stage that the source is currently in, that will be chosen unless you choose differently in this field. If nothing is selected, a default stage will be chosen. Clicking the “Add” button finalizes the creation of the action. For the Title, choose one that describes what the action does. Choose the stage change when the trigger should activate. Select the Action that needs to be executed when this trigger activates (the one created earlier), and click “Add”. Finalize the creation of the trigger by clicking the “Add” button. If the move entity action is set up with a stage change trigger, the user moves the entity by changing the related stage, however this is done. This can be done e.g. through a wizard (1), assuming such a wizard is set up, or by clicking the next stage in the stage overview of the project ((2) and (3)). This will in effect trigger the move action, and the project will be moved to the Archive module. Note that at first the TestProject3 is located on the Projects module list. 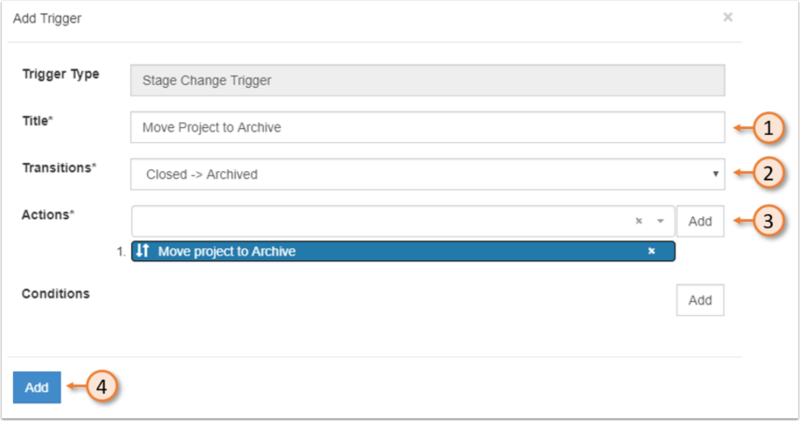 After clicking the “Move Project to Archive, the project is now located in the ProjectsArchive module list. Also note that if not using this feature in combination with Action Management, the only other way to use it is through the WebAPI. This feature cannot be used directly through the WorkPoint solution interface by the user. As shown in the image, the first item from the Projects module is moved to the Projects Archive module, but the site stays where it is and the link from the moved entity to the site also persists.